We are a passionate team at Blants! Passion is what inspires us, gives us our kick-start, our mojo each day! We love what we do! That same passion inspired us to formulate ‘Laundry Blend’. Modern washing detergents are a chemical concoction. Many skin sensitive, chemical sensitive, or scent sensitive people can experience distress after washing in commercial laundry detergents. It seems there remains a residual of those chemicals within the fibres of materials. Most of us would prefer an alternative! 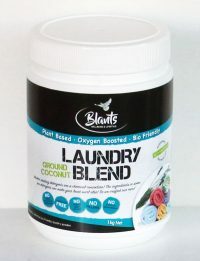 There are some aptly named eco friendly laundry powders on the market, but a read through the ingredients in some of those even leaves you wondering! So we decided to craft our own. We tested and tweaked it until we arrived at our crafted formula we simply named Laundry Blend. 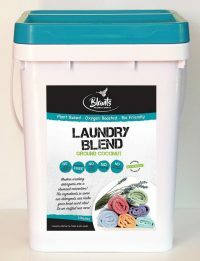 Our Laundry Blend is a plant and mineral based formula that really works! That’s really good news ! Ground Coconut Soap – this is Blants own Ground Coconut Soap made in Sri Lanka exclusively for Blants. Made from three simple ingredients – Organic Coconuts, Lye and water. Fat or oil, lye and water are the three base essential ingredients of any soap. We don’t add anything extra. Washing Soda – Our Washing Soda is from a Natural source in the USA. Washing Soda is a key ingredient as a water softener in some commercial washing detergents. Hard water is water with high levels of minerals. Those minerals limit the sudsing/soaping of detergents. Washing Soda both cleans and softens water allowing the soap to clean effectively. For best results part fill the machine with water. While it is filling add 1-2 scoops of laundry blend to a bucket and add 2 cups of very hot water. The hot water infuses the blend causing it to suds and rise. Swirl and mix in the bucket and add to the agitator or straight in the wash. Can wash on any temperature but for best results wash on warm – warm/hot cycle. During our trial period we asked some folk to test Laundry Blend in their front loaders. They gave it the thumbs up! If you own a front loader you would be aware some detergents & powders are not suited to front loaders since front loaders need low sudsing cleaners. 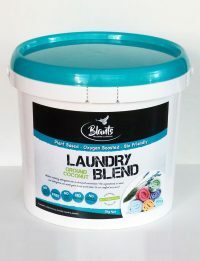 So, we need to say “Blants Laundry Blend may not suit your front loader. Initially start with only a half scoop to assess its suitability to your machine and if ok, increase in increments until you find the amount suitable for your machine”. Once you have determined the amount suited to your machine, simply fill the detergent drawer with that amount and start the wash on hot to release the oxygen & activate the blend. Once mixed into the water switch to a lower temperature if you wish to. 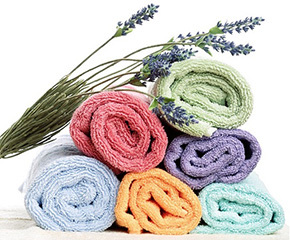 The amount of Laundry Blend needed per wash will vary from wash to wash depending on the machine size, the wash level, and level of soiling on clothes. 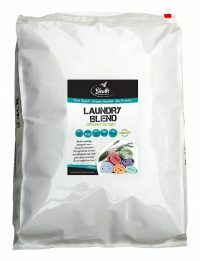 Laundry Blend is available in NZ online in 800g, 4kg, 9kg, and bulk 20kg.